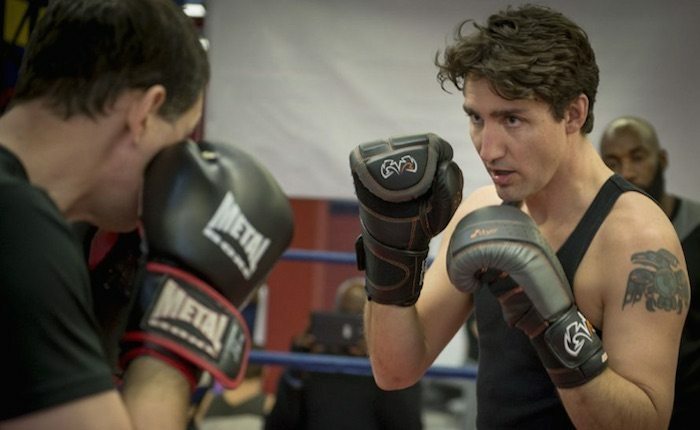 Five years ago, Canadian politics changed inside a boxing ring. The then backbencher MP Justin Trudeau fought the Conservative Senator Patrick Brazeau. Trudeau won so convincingly that he began his rise to power. Now on the anniversary of the fight Toronto Star contributor Declan Hill – who also fought that night – jumped in the ring with our Prime Minister to check his boxing form and to interview him about the fight and the state of our nation. In the United States they have Presidential press conferences: up here the Prime Minister tried to punch me in the jaw before an interview. I blocked his blow and then, as I started a counter-attack, realized something odd: it is difficult to hit a Prime Minister. I do not just mean that this particular Prime Minister is six foot two, has a long, left-handed jab and is a good boxer. I mean, that he is – well – you know, the leader of our country. Regardless of one’s politics, fighting such a symbolically important person is strange. He stood there in the ring wearing a black shirt and white shorts with Canadian flags on them and for a very brief moment I found it difficult to attack him. Then Justin Trudeau hit me in the face and I forget about any niceties and tried to punch him out. When the historians of our era come to examine one of the moments that ended Stephen Harper’s Conservative government, they will not write of a speech like Martin Luther King’s ‘I Have a Dream’ or an action like Viola Desmond’s refusal to move from her cinema seat or Gandhi’s protest march across India. Rather they will point to Round Three of a boxing match on March 31st, 2012 when one man battered the other against the ropes so hard that the fight was stopped. It was the Fight for the Cure, an Ottawa fundraising event for cancer victims where a group of mostly businessmen, lawyers and real estate developers box it out. At the centre of this event were two politicians: Patrick Brazeau and Justin Trudeau. At the time Trudeau was a well-known but largely-ignored back-bench MP blessed and cursed with the name of his famous father. The right-wing journalist Ezra Levant captured the view of many Canadians that Trudeau was a ‘Shiny Pony’: a rich, privileged kid who just did not get the problems of ordinary people. Patrick Brazeau was a relatively-young Conservative Senator with a reputation as a tough, street-fighter in the world of native politics. He also had a black-belt in martial arts and was expected to beat Trudeau easily. Sun TV was so certain that Trudeau would be defeated that they televised the fight nationally. The room was packed with Tory supporters and Levant was there to see the downfall of the ‘Shiny Pony’. That night, I had a unique view of both men and the fight as I fought in a bout just before them against the manager of a local pub. The whole world goes grey when you fight in a boxing ring. To the spectator the fight is a multi-coloured theatrical event: the uniforms of the fighters, the bow-tied referee, the clothes of the other spectators. To the fighter the only thing that matters is that you are confined in a ring with another person who wants to hurt you very badly. Your world is focused on one single other fighter. Every other sound or detail is removed from your brain. Trudeau did not just win that night. He pummeled Brazeau into submission. Harper’s government was stunned. The rest of the country was equally surprised and the imagination of the nation was caught. There were, for sure, other twists in the story that changed the government but that fight was a key, symbolic moment in the political history of Canada. At the end of the night – I had also managed to win my fight – Trudeau and I stood at the back of the hall. The Conservative supporters were streaming out their heads down. The only two tables of Liberals in the vast hall were dancing on their chairs. 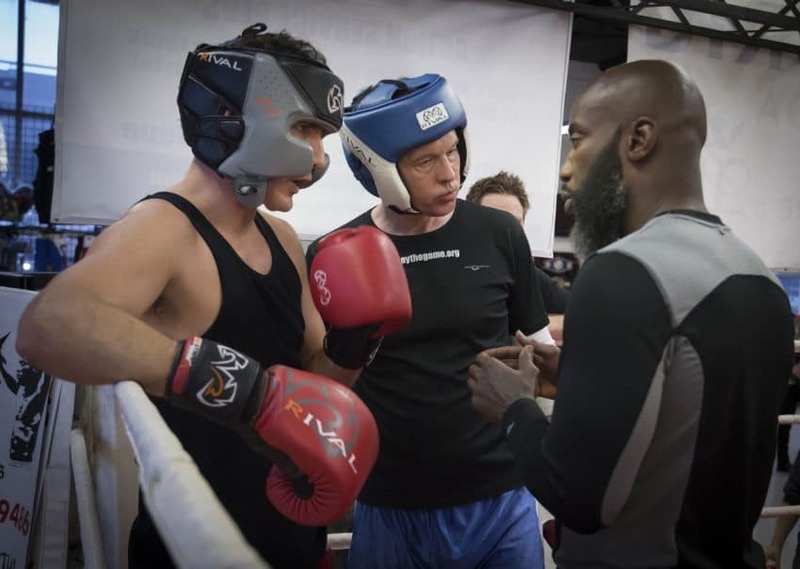 Five years later, Trudeau and I decided to go back into the ring to do a couple of rounds of sparring and then an interview about the night that changed Canadian politics. 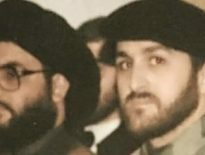 He has continued to train hard and has even built a small boxing ring in the bottom of a government building in Ottawa but Trudeau chose to fight at Ali Nestor’s gym in his own multi-cultural riding of Montreal North. Nestor was Trudeau’s secret weapon – a former MMA and boxing professional – who trained him. On a cold March night, Nestor had the two of us spar at the ring in the centre of his gym. In the ring, Nestor had us warm-up by practicing jabs. 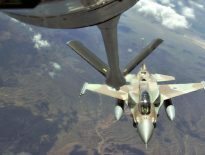 The point of the exercise is for the fighters to get their range and timing of only their left-handed jabs. At first, Trudeau and I circled around each other hitting and blocking. Then having received a jab in the head, I stepped forward and unleashed a straight right into the Prime Ministerial face. “My gosh! I am sorry,” I said putting my arms in the air. 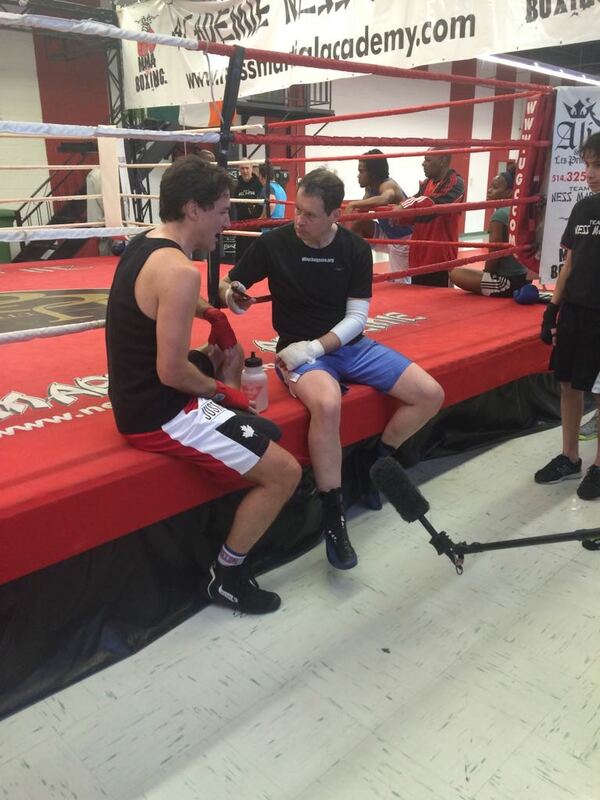 At the end of the sparing, Trudeau sits on the side of the ring and talks. He is in a reflective mood and speaks of ‘narratives and story arcs’ but says that he could not have become Prime Minister without winning the fight. There were only a few people in the gym that night but one of them was a local City Councillor. She leaned over the ropes screaming for Trudeau to hit me harder. Her voice was so loud that it even broke into my fight concentration. “The same narrative happened when I became a leader,” says Trudeau staring at the floor and speaking about how most people thought he would easily be beaten in the fight. Then he draws the parallel to himself as a politician. I surprised everyone by outworking everyone else on the ground. And showing that I am a very quick study. So I thought after that it will be difficult because I sneaked up on everyone and I won. 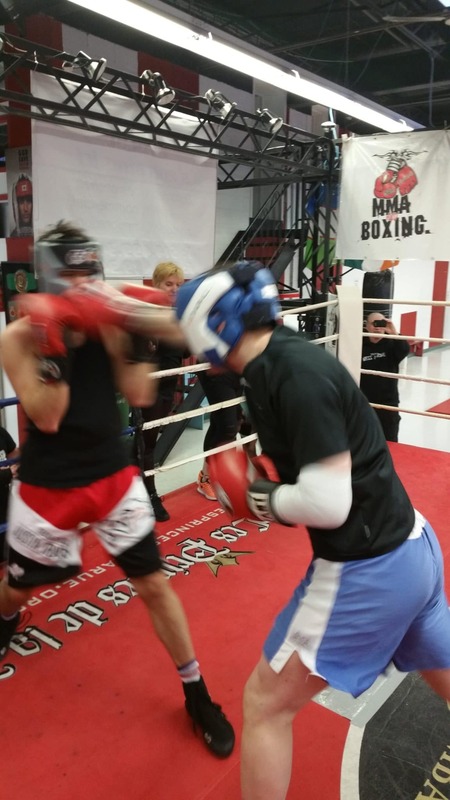 Ten seconds left in the sparring round. Trudeau came at me with three upper-cuts. I blocked and then grabbed him into a clinch. We tussled briefly against the ring. Then the referee blew the whistle. The fight with the Prime Minister was over.